For a Class-Struggle Fight to Defend the Unions! Break with Laborism—For a Revolutionary Workers Party! Fed up with deepening attacks on their working conditions and right to organise, 100,000 unionists choked Melbourne’s streets on 9 May in one of the biggest protests in Australia for 25 years. In defiance of legal threats, construction and maritime workers walked off the job. They were joined by thousands of workers from every sector including manufacturing, transport/logistics, health and education. This protest march was part of the ACTU’s much-publicised campaign to “Change the Rules” of industrial relations. Along the route the march stopped at the Melbourne Magistrates Court where frame-up charges were being heard against the CFMEU (now CFMMEU) construction union’s Victorian leadership. Days later the charges were dropped. Since the global economic recession that erupted in 2007 capitalist rulers around the world have ratcheted up a one-sided class war to make working people pay for a crisis engendered by the bosses’ irrational profit system. In the U.S., previous union bastions have been bludgeoned, with wide swathes of the American proletariat now working for poverty wages. Even in auto manufacturing, which historically had high-paying union jobs, half of all production workers make under U.S.$15 per hour. In Europe, major capitalist powers such as Germany are using the reactionary European Union consortium as a vehicle to impose vicious austerity measures on weaker countries such as Portugal and Greece, while wages and conditions of workers across the continent are under attack. Meanwhile, in sweatshops from Bangladesh to Indonesia, the Philippines and beyond, millions of workers toil for starvation wages as a thin layer of capitalist-imperialist exploiters rake in fabulous profits. Over the last ten years the devastating effects of the global economic crisis in Australia have been masked by the massive demand for mineral resources, above all by the Chinese bureaucratically deformed workers state. In fact, outside the resources sector, parts of the economy have stagnated or gone backwards. More than 200,000 jobs in manufacturing have been cut and the entire car manufacturing industry destroyed. Today, with the mineral resources boom winding down and the drumbeats of U.S.-led global trade war echoing around the world, a deeper reckoning is fast approaching. To maintain a competitive edge against international rivals, the Australian capitalist rulers are striving to increase the rate of exploitation of the working class at home, pushing for a more atomised and submissive workforce with even less rights. This is the context for the Turnbull federal Liberal/National Coalition government’s savage union-busting agenda, which has been spearheaded by the years-long state vendetta against the CFMEU construction union. The bosses’ latest tactic to destroy remaining strongholds of unionism is to simply cancel or end enterprise agreements (EBAs) with unions, and present workers with non-union contracts with massive cuts to wages and conditions. This happened at CUB’s Melbourne brewery in 2016 and a struggle against this is ongoing at ExxonMobil’s Bass Strait oil and gas operation. Labour-hire companies have become such a part of the landscape that full-time secure employment is just a dream for most youth today. Some wages have fallen so far, particularly after cuts to penalty rates, that even the Reserve Bank is worried about the effect on the broader economy. On top of this, access to welfare and pensions is being slashed while quality medical care and higher education are out of reach of many working people. Little wonder that a July Australian Council of Social Services report shows that inequality in Australian society is now deeply entrenched. While the banks and mining magnates continue to revel in massive profits, and the Turnbull government offers large tax breaks to the big end of town, there is widespread anger among workers and the poor at the large gap between the “haves” and “have-nots.” It is in this context, and under pressure from its base, that the ACTU, led by Secretary Sally McManus has been pushing its campaign to “Change the Rules.” Demanding that workers should have the right to collectively bargain, this campaign rightly takes aim at the slashing of wages and casualisation of jobs. The rules are indeed stacked against working people. Witness the plethora of laws designed to criminalise effective union action such as solidarity strikes and mass pickets. But far from organising the necessary class-struggle fight, the ACTU campaign is tied to a strategy to pressure Labor and get them re-elected by “winning the debate” about the need to redress inequality in society. McManus argues that the union movement “will change where the centre is” and “If we win public opinion, we expect Labor to deliver on that” (Guardian, 22 July 2017). The idea that the interests of the working class and oppressed can met by returning Labor to the government benches in Canberra is a lie. 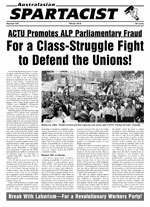 Founded by the trade-union bureaucracy following the defeat of the 1890s strike wave, the ALP’s origins lie in explicit rejection of class struggle. Campaigns designed to tie workers to ALP parliamentary reformism have always been a graveyard for proletarian and social struggles. Pro-capitalist in its leadership and program while based on the unions, the ALP has historically used its links to the proletariat to both lull and keep them in check. Through this mechanism, in times of crisis, such as the two world wars of last century, the ALP has served the ruling class by presiding over the capitalist order. In power the ALP has time and again suppressed worker struggles. On occasion it has also served to co-opt left- moving forces, such as in the early 1970s when the Whitlam Labor government introduced a number of reforms to placate a restive working class. When Whitlam was ousted in 1975 by the Queen’s representative, the governor-general, tens of thousands of workers spontaneously poured onto the streets in outrage. But the potential for a challenge to capitalism was stymied when ACTU and ALP chiefs diverted seething anger into parliamentary impotence. In the subsequent elections the Liberal Party’s Malcolm Fraser was elected, and a renewed anti-worker offensive opened up. While this offensive has continued to this day, there have been struggles by workers and occasional victories. Even the smallest win against the bosses is to be welcomed. However, as is always the case under capitalism, reforms benefitting working people are only ever a pallid and highly reversible glimpse of what will be achievable once workers have overthrown the capitalist system. The latter will never be achieved as long as the Laborite union misleaders and their ALP parliamentary brethren get away with duping workers that their interests can be satisfied through the ballot box. “Change the Rules” is the ACTU’s biggest campaign since its 2005-07 “Your Rights at Work” campaign against the Howard Liberal/National Coalition government’s union-busting “Work Choices.” “Your Rights at Work” co-opted massive proletarian opposition to Work Choices and re-directed it into a campaign to elect the Rudd/Gillard Labor government. This was eloquently captured when, as election day approached, the main slogan “Your Rights at Work—Worth Fighting For” was supplanted by “Your Rights at Work—Worth Voting For.” The industrial relations laws the ACTU now seeks to change were in the main introduced by the very Labor government they campaigned for in 2007! Rebadging the Arbitration Commission with the Orwellian title of Fair Work Australia (since called Fair Work Commission [FWC]), the Rudd/Gillard government extended the existing draconian restrictions on the right to strike, banning solidarity strikes, “political” strikes, and strikes in defence of victimised unionists. Rudd/Gillard’s Fair Work Act (FWA) allows strikes only if related to an expired agreement, only after the FWC approves a secret ballot overseen by the state, and only after giving three days notice to the bosses, among other restrictions. Even then, the FWC still has the power to ban any strike action if they deem that it is “adversely affecting” the company and a “third party”! In January this year the FWC banned a strike by NSW rail unions even though the unions had met every legal requirement in the lead-up. It was the Rudd/Gillard government that stripped away many existing union conditions and set up the framework for Turnbull’s cuts to penalty rates, which began last year. The FWA severely restricts what conditions EBAs may cover. For example, it bans any attempt to restrict labour hire. It also entrenched the ban on industry-wide bargaining, first set in train by the Hawke-Keating Labor governments (1983-96). Hawke-Keating’s Prices and Incomes Accord, a class-collaborationist pact between the government, ACTU and bosses, resulted in workers’ wages and conditions being slashed. Unions that resisted this “consensus” model, such as the Builders Labourers and the Pilots Federation, were smashed by the Labor government with the connivance of the ACTU leadership. Today it is Labor’s FWC which enforces the cancellation of union EBAs and bans real pickets that would shut down production by stopping scabs from entering worksites. Even the use of the term scab to describe these low-life strike-breakers can result in a worker being sacked. While Rudd rebranded, and somewhat constrained, Howard’s union-busting ABCC, repression and fines against the construction union continued. The current Labor leader, Bill Shorten, whom the union tops hope to boost into the Lodge at the next elections, was key to ousting Rudd from the prime ministership at the behest of the mining magnates in 2010. As Workplace Relations Minister in the subsequent Gillard-led Labor government, Shorten enforced anti-union laws. During the CFMEU construction union struggle against the Grocon empire in 2012 Shorten accused construction workers of “intimidation, violence and thuggery.” Now, Shorten claims he’ll roll back the government‘s penalty rate cuts (which, as a Labor government minister, he first set in motion). At the same time he cannot even mouth a promise to restore the right to strike. Despite Labor’s wretched history of anti-union attacks, most union officials continue to support the ALP. At bottom this reflects the unitary pro-capitalist outlook of a privileged layer within the workers movement. Serving as labour lieutenants of the capitalist class, the union tops seek a partnership with the bosses in the “national interest,” while sowing illusions that workers can share in Australian capitalist prosperity. But the only interest the bosses are concerned with is the interest on the profits they obtain from the exploitation of workers’ labour power. There can be no common cause between the proletariat, who survive by selling their labour power, and the capitalists, who grow rich from the exploitation of this labour. With their hands on the levers of production, the working class possesses tremendous social power. What’s needed is a leadership that bases itself on the strength of the working class, independent of and ready to stand in defiance of the bosses’ courts, parliaments and government. In the course of class struggle there needs to be a political fight within the unions to exacerbate the contradictions between the interests of the working class and the policies and actions of their current social-patriotic Laborite leadership. It is through such intransigent political opposition within the unions that the proletarian base of the ALP can be won away from its pro-capitalist leadership and a revolutionary Marxist party forged. A class-struggle leadership of the unions would demand hefty wage increases, tied to, at minimum, real cost-of-living increases. To unmask the exploitation, robbery and fraud of the capitalist owners and the swindles of the banks, it would demand that the capitalists “open their books” to reveal to all members of society their naked pursuit of profit. It would demand union control of hiring and training and fight for full-time, permanent jobs, putting the labour-hire parasites out of business. To fight unemployment it would demand a shorter workweek at no loss in pay in order to spread the available work around. Against the craft and enterprise divisions fostered by the bosses, it would fight for industrial unions encompassing all workers in an industry based on the struggle for “one out, all out.” And it would fight for a massive program of public works, paid at full union wages, to replace the rundown schools, hospitals, roads and public transport system, and provide decent housing for all. Such demands would aim to mobilise the proletariat in struggle around its felt needs and link these struggles to the necessity of liquidating the whole system of wage slavery. History has shown that for the proletariat to be successful in this task it needs a revolutionary vanguard party committed to the fight for workers revolution. One of the sharpest expressions of the ACTU’s loyalty to the capitalist system is their argument that the current conservative government has undermined the “independence” of the Fair Work Commission. McManus and her acolytes talk up the need to restore compulsory arbitration and to strengthen the FWC to go after employers that “abuse the system.” This is a crock. No amount of tinkering can change the fact that Arbitration is not, and never can be, an independent and neutral arbiter. Like all courts, Arbitration is a bosses’ court. It is no “safety net” for workers but a safeguard for the bosses to keep workers’ struggles firmly constrained. Arbitration is part of the state machinery whose purpose is to protect bourgeois rule and profits against the struggles of the working class and oppressed. At the core of this repressive apparatus stand the police, military and prisons. Set up in 1904, compulsory arbitration was from the beginning part of a racist pact forged between the Laborite bureaucracy and the capitalist rulers. This was based on an agreement to drive out, and keep out, all non-white labour, and for protectionist barriers and state subsidies to foster industrial development by the bourgeoisie. The third underpinning of early Labor reformism was integration into the capitalist state and subordination of the working class to it through the mechanism of compulsory arbitration. Together these historic components of Laborite nationalism have always crippled the Australian working class, tying them to their class enemies and setting them up against their proletarian brothers and sisters in other countries. Capitalist governments everywhere enact laws to stop the working class doing what is necessary to defend and improve its conditions. But what they can get away with depends on the balance of class forces and the calibre of workers’ leadership. When Sally McManus took over the reins of the ACTU last year she gained credibility among many workers by talking about “breaking unjust laws.” Today, rather than boasting about the need to break the rules, the ACTU tells us the “rules are broken.” The truth is the rules are doing precisely what they were designed for: to keep the working class in subjugation to the owners of capital. As opposed to toothless publicity campaigns and ACTU photo ops, for instance at the year-long informational picket at ExxonMobil’s Longford gas plant, what’s needed are solid strikes backed by mass pickets, black bans and occupations in defiance of the bosses’ anti-union laws, court injunctions, charges and penalties. In 1969 when tramways union leader Clarrie O’Shea was jailed for refusing to pay fines imposed for defying anti-strike laws, mass strike action—largely led by Communists—not only won his release but turned the anti-union penal powers into a dead letter for over a decade. Most of the reformist hangers-on of the union bureaucracy, from Socialist Alliance (SA) to Socialist Alternative (SAlt), have enthusiastically backed the ACTU’s current campaign. Expressing minor discomfort in promoting a vehicle to elect another Labor government, they counsel the ACTU to not give the ALP a “blank cheque.” Likewise, the Socialist Party (SP) also advises the union misleaders to not “give Labor and the Greens such an easy pass.” To make the campaign a little more militant sounding, the SP suggests the ACTU work toward a national stoppage. In their fawning over the ACTU campaign, the reformists reveal an outlook that does not go beyond pressuring the union sell-outs to pressure Labor, and the capitalist Greens, to administer a reformed Australian capitalism. Coming from a seemingly very different trajectory the Socialist Equality Party (SEP) correctly notes that the purpose of the ACTU’s campaign is to re-elect Labor. But beware these political bandits! For over two decades they have decreed that unions are reactionary organisations that workers should oppose. Equating the basic economic defence organisations of the working class with their pro-capitalist misleaders, the SEP makes common cause with bourgeois exploiters such as Chris Corrigan and Daniel Grollo who want to destroy the unions. SAlt, SA and the SP maintain a guilty silence on the nationalist, protectionist underpinnings of the ACTU campaign, nauseatingly expressed in the constant refrain about the Australian “Fair Go.” Fair go? Tell that to refugees languishing in hell-hole detention centres like Nauru and Manus, or Aboriginal people facing “Third World” living conditions and racist state terror, or the besieged Muslim minority vilified and targeted for state repression as “terrorists.” Or what about the thousands of workers maimed and hundreds killed on the job every year. In a review of McManus’s speech launching the “Change the Rules” campaign, even the bourgeois liberal Overland was forced to acknowledge “a couple of short forays into lazy jingoism (‘the Australian way of life’).” Contrary to “short forays,” McManus’s speech was imbued with nationalism from start to finish. The problem is “Americanisation” and “multinationals”...“ripping Australia off.” McManus demands government preference for Australian products, and attacks the employment of overseas workers for “denying job opportunities to local workers.” It’s not overseas workers that cause unemployment, but the capitalist system. This protectionism and economic nationalism is poison to united working-class struggle. All it protects are the profits of the Australian bosses while pitting one section of workers against another. A class struggle leadership would fight for proletarian internationalism. It would seek to organise all the unorganised workers including “guest” and other visa workers, with full union wages, conditions and responsibilities. This requires a forthright stand against deportations and for full citizenship rights for all who have made it here. To defend itself the working class must reject the bosses’ divide-and-rule tactics and defend all victims of capitalist tyranny—from Aboriginal people to single mothers, Muslims and refugees. What is desperately necessary is a class-struggle fight that recognises that ultimately the only way to put an end to the miseries of capitalism is through workers revolution. To realise this, the proletariat needs the leadership of an internationalist Leninist-Trotskyist party. Such a party would be a tribune of the people, ready to take up the struggle against all manifestations of capitalist oppression. It would be committed to the fight to smash this system of wage slavery and establish the rule of workers councils on the road to an egalitarian socialist society free of the exploitation, racism and war that defines the capitalist system. Down With Racist Campaign Targeting African Youth! Defend North Korea Against U.S./Australian Imperialism! Raising the Banner of Leninism!